We are presenting in the book form the short biographies of the ‘Path-breakers’, who are considered to be ‘Icons of the world’, by being pioneering and innovative in their chosen fields. We strongly believe these biographies are very useful to not only children but also youth and every one. Within the limitations, the books as good reference base, and “exclusive” among the short biographies are presented to the readers-both young and old, who would be interested to read such books and to preserve them as treasure. In fact it is an adventure to preset the biographies in just about 64 pages, of such great personalities who made their live, sublime and noble through their assiduity, benevolence, commitment, dedication, excellence and so on. Dhirajlal Hirachand Ambani was and Indian business tycoon who founded Reliance Industries in Mumbai along with his cousin. 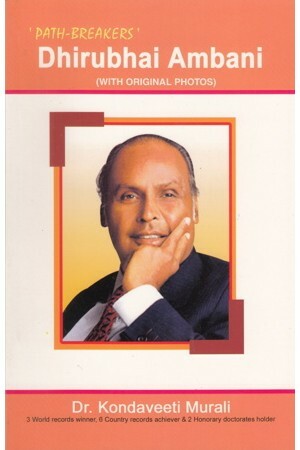 His life story is popularly known in the society as “Rags-to-riches businessman” story. In 1977, Ambani took his company public. He was among the selected few who appeared in the Sunday Times list of top 50 businessmen in Asia.